Baking my way round the United Kingdom, trying out regional specialities, traditional ingredients etc., and generally making (and sampling) nice things to eat in the cake, biscuit and bun line. Now with the assistance of my junior chef, Ellis. Godcakes seem to be peculiar to Coventry, although similar pastries known as God's Kitchels (or Kichels) have an association with the Suffolk area (according to Florence White). Both Godcakes and God's Kitchels were handed out at the beginning of the year (or Easter), by godparents to godchildren. The idea was that when a godchild approached their godparent to request a blessing, they would come away with a double-whammy - a blessing and a cake. A fair deal for the godchild, I think. 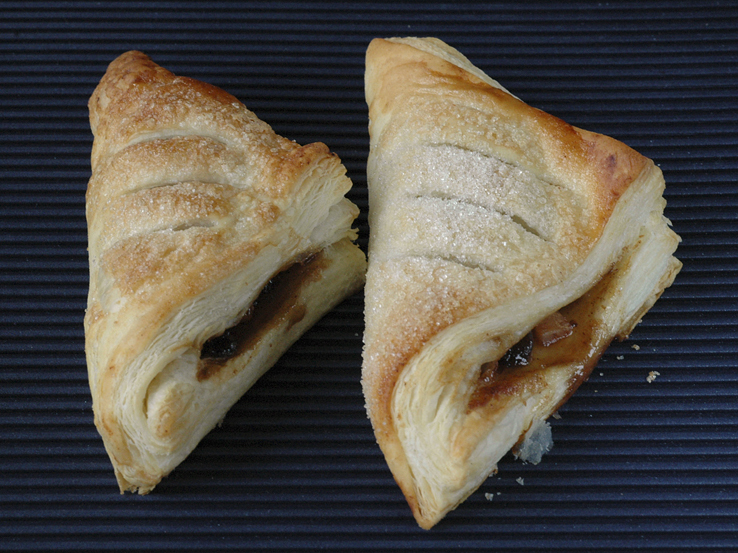 Many internet sources claim that Chaucer mentioned Godcakes, but from a speed through online transcriptions it appears that it is Godde's Kichels that are referred to - see The Sompnour's Tale (set in Holderness, Yorkshire). From a glance at the photo at the head of this posting, many pastry fans will see that Godcakes bear more than a passing resemblance to jam puffs; and to be fair, aside from the filling they are identical. Jam puffs are known apparently known in the bakery trade as 'Coventrys', by reason of their descent from the Coventry Godcake. 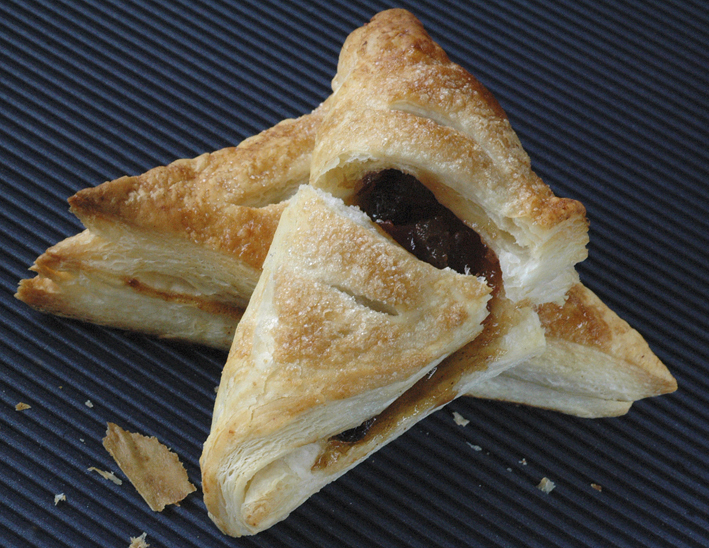 Godcakes are filled with mincemeat rather than fruit/jam. Historically, Godcakes ranged in size and price, depending on the pocket and generosity of the godparent. 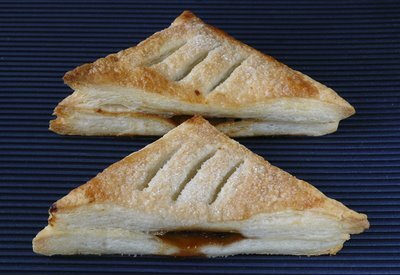 The triangular shape, along with the three slashes in the top of the pastry, has led to speculation that the cakes were representative of the Trinity, but this is an assumption rather than a fact. Dorothy Hartley mentions this association with the Trinity, but says 'the origin is obscure'. Godcakes are very easy for the heavily pregnant and time-poor cook to assemble. They are also a good way of using up any leftover Christmas mincemeat. Some recipes call for an addition of rum to the mincemeat; and if you fancy slipping a measure in, then please do so. 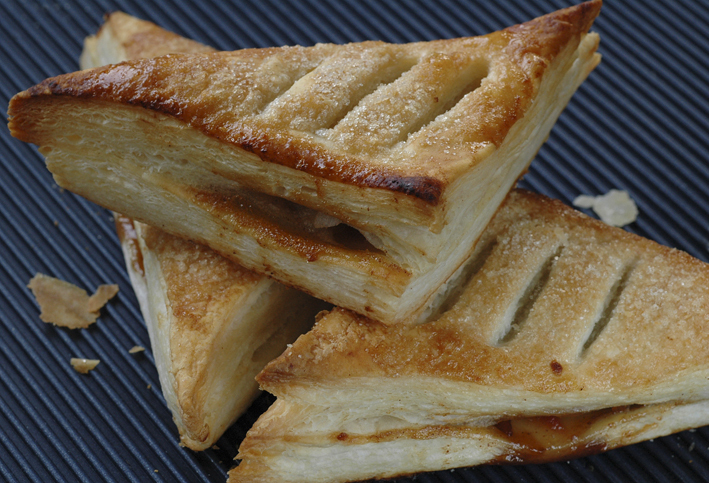 If you purchase a pack of puff-pastry, then this recipe couldn't be simpler. Recipes and methods vary very little between sources - both Florence White and Dorothy Hartley carry recipes, but see also Town & Country Fare & Fable, and English Teatime Recipes. 1. Preheat oven to 220C/425F/Gas mark 7. 2. Roll out the pastry on a lightly floured surface. 3. Methods divulge at this point, so you can either cut out squares (4 inches per side), and then cut the squares into triangles; or leave the squares uncut. It depends whether you want to make your Godcake using two triangles pressed together, or using a square folded diagonally. I tried both ways to see what worked/looked best. 4. Place a teaspoonful of mincemeat in the middle of your pastry shape. Don't be too generous, otherwise the mincemeat will squidge out when you press the pastry together. I found that if the quantity looked a little mean in my eyes, then it was sufficient. 5. Moisten the edges of the pastry with a little water, and press either the second pastry triangle on top, or fold the other half of the square over to form a triangle. Press the edges of the triangle to form a seal/eject mincemeat all over the worktop. 6. Cut three slashes in the top of your Godcakes. Brush with egg white and sprinkle with sugar. 7. Bake for approx. 15 minutes, or until golden and well puffed up. 8. Cool on wire rack. The two triangles method produced a very neat looking cake - should this matter to you. Needless to say, regardless of method, both sets of cakes were consumed very quickly, without either consulting godparents or considering the needs of those requiring blessings. Bless us. 15.8 The Footpaths and Highways Committee will consider the request to re-plant the Godcake in Oldwich Lane. Please no-one write and tell me that this doesn't refer to a large jam puff at a crossroads. These look like the apple pop-overs we make. Yummy with a scoop of vanilla ice cream. Anna - these are totally unknown to me! Now that I'm back in Estonia, I trust you'll keep me updated about all those delicious British pastries and cookies and cakes! I've really admired your blog and glad to see you're posting again- I look forward to more recipes! Those look really delicious! The flaky pastry and the gooey filling. Yum! Wow, they look so tasty. Delicious! I've only recently discovered your blog, but it is fascinating and will become compulsive reading (and eating)!Thankyou. I am only an ignorant Canadian but what is the difference between these and Eccles cakes? Or are the Eccles cakes we get here a weird version of the real thing like chow mein and chinese food? They generally are round and have three cuts in the top, filled with mince meat. I love your blog. Good luck with the pregnancy! Pille - Is it good to be back home? If there is any British food in the cake/biscuit/bun line that you find yourself really missing, let me know and I'll bake it/send you the recipe (even send you a taster if it will travel!). Sarah, you are right to question the difference between these and Eccles cakes. Yep, they also contain a form of mincemeat, and have the three slashes in the top. Only really difference is the shape - Eccles cakes are circular. If you check out an earlier posting I did on Banbury cakes, you will see that these too are similar to both Eccles and Godcakes. Guess that we Brits found something we liked and reworked into different forms, giving each it's own identity by coming up with a distinctive shape. I love your blog - you write so well and the mix of foodiness and history and practical recipe testing is wonderful. Are you interested in writing a book? And do you have an agent? If not, I'd love to talk to you about book ideas. I'm an agent at Greene & Heaton (www.greeneheaton.co.uk) and my phone number is 020 8749 0315. I look forward to hearing from you. This is a beautiful blog - I've found a wonderful old book in a jumble sale which is called Country Recipes of Old England - published by Country Life, compiled by Helen Edden - 1929. This is full of rare local county recipes such as the ones you are trying out. Its so nice to have these brought alive again by you. My son and I will try out any that have a vegetable theme - ( thats the purpose of our blog. Have linked to your site. I like the sound of your cookbook. Hope that it turns up some good recipes, and good luck with your challenge of getting Freddie to love vegetables! Hi, I love your blog! I thought you or your other fans might be interested in this competition I stumbled upon at the supermarket yesterday for budding food writers. There's even a £20,000 book contract up for grabs! I know I can't resist it! Thanks for the education. I thought Coventry Godcakes was just another name for jam puffs. Can I offer a link to another blog - www.yellowswordfish.com/735/how-to-make-a-london-cheesecake/ - for the discussion on whether such things would have been semi-circular rather than triangular originally. I just wanted to thank you - my mother who was born in Coventry used to call the triangles of grass at junctions god cakes but I didn't know why. I thought if anything it might be because the little bit of land, no use for grazing or cultivation was left to God. But now I know I have made some and they were lovely. Will make some instead of mince pies this Christmas. The recipe I have for these suggests a filling of four parts currants and one candied peel, soft brown sugar and either allspice and nutmeg or mixed spice and cinammon with the addition of rum as optional. I think the individual cook/baker would find a mix that suited their taste. I know that piece of green - we have friends who leave literally around the corner from it! What a coincidence. Thanks for sharing the information. We are a full-service company providing all aspects of landscaping under one roof, including design, maintenance, construction, irrigation, Brick walls, Ponds, water features and lighting for residential and commercial clients.